Girls’ Generation has now taken the top spot on Oricon’s Daily Single Chart with their latest Japanese single, “Galaxy Supernova”. 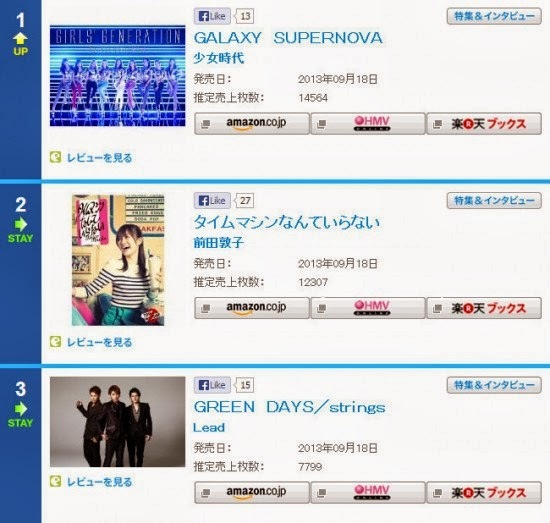 According to the Oricon Charts, Girls’ Generation’s “Galaxy Supernova” which debuted fourth in the first day of release, grabbed the #1 spot of Daily Single Chart after selling 14,564 copies. Girls’ Generation released their eighth single “Galaxy Supernova” in Japan on September 18. The song will also be used in conjunction with the girls’ new endorsement deal with Japanese fashion company Samantha Tavasa.